Digital billboards provide the technology to create customizable flexibility in outdoor advertising. With these digital boards, the advertiser is able to tailor a message or multiple messages according to time of day, seasons, holidays and other special dates and events. Our displays allow crisp images and colors that catch the attention of those driving by. Plus, campaigns can easily be rotated between different billboard locations to extend and diversify audience reach. The possibilities are endless! 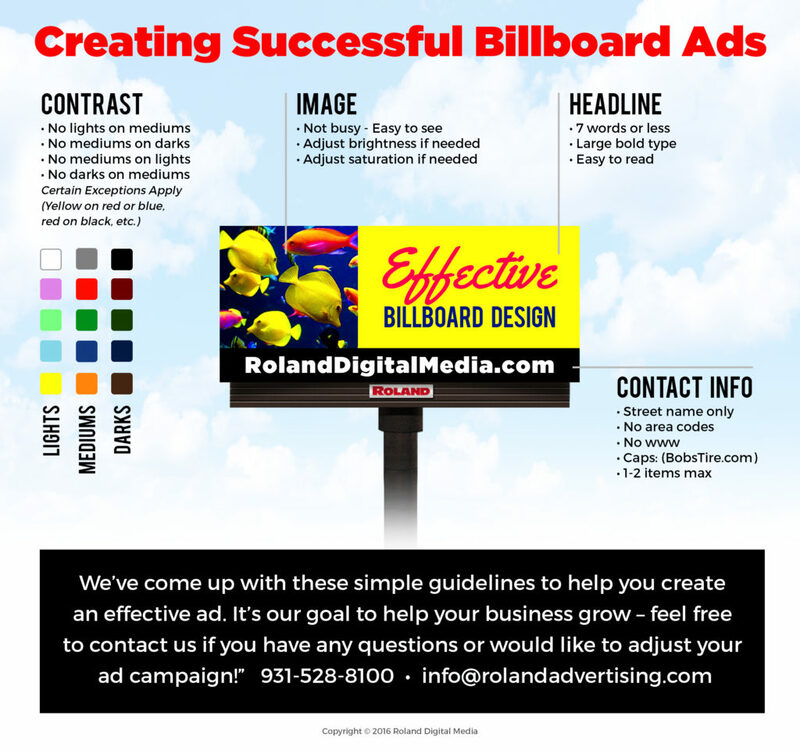 Stick with the tips above and you are on your way to having a successful, well-rounded digital billboard campaign. Can the message be more succinct? Rule of thumb: maximum copy, seven words! In outdoor design, “less is more”. Does the letter S P A C I N G (or kearning) read at distance? Is it strong and clear? Is the visual content unified? Is your poster recognizable at a distance? Is the brand name or logo readable at a distance? Color combinations affect apparent size and readability. Does your printer know your exact needs? Is your art optimized for your printer’s needs? Is the art suitable for extreme enlargement? Design at 10.5″ x 24″ at 350 dpi. Include an additional .5″ all around for bleed. CYMK color mode. Design at 10.5″ x 36″ at 350 dpi. Include an additional .5″ all around for bleed. CYMK color mode. Design at 1104 x 480 pixels at 72 dpi. RGB color mode. Design at 1080 x 278 pixels at 72 dpi. RGB color mode. Design at 1000 x 500 pixels at 72 dpi. RGB color mode.